God, how they hated it! Republicans control the Arizona legislature. They're determined to continue their anti-public school crusade by starving schools of funds, and they've been doing a pretty good job of it. Then teachers donned their RedforEd T-shirts last spring and paraded in front of the Capitol, tens of thousands strong. Teachers won the media battle as well as the hearts and minds of voters. Republicans were forced to paste on smiles and talk about how much they respect teachers and love school children. Gritting their teeth, they voted to budget extra money for teacher salaries. It wasn't enough, but it was more than most people expected, and much more than Republicans wanted to give. This session, some Republicans think it's time to take revenge on the teachers with legislation that would restrict teachers' speech during school hours, prohibit schools from shutting down during a walkout and allow any legislator to demand that the Attorney General open an investigation into a school district if the legislator alleges it has violated the state's law or the Constitution. So far, the pieces of legislation have gone nowhere. So far. I dearly hope they will be ignored to death. I wouldn't be giving them this bit of publicity if Arizona was an isolated phenomenon. But two other red states hit by teacher activism have gone the same route: Oklahoma and West Virginia. If it was only Arizona, well, that's Arizona. But when the same thing happens in three red states, it starts to look like a trend. An Oklahoma bill would make it illegal for anyone employed by a school district to strike or threaten to strike. If teachers try to call it a walkout, not a strike, the bill has got that covered. If teachers "close schools or interfere with school operations" as a way of making demands, they would be breaking the law. In West Virginia, the good news for teachers is, the proposed state budget would raise teacher pay and improve health coverage as promised when teachers walked out last year. But the budget package also includes increasing class sizes, taking away teacher pay for days they are on strike, supporting charter schools and beginning a voucher system similar to Arizona's Empowerment Scholarship Accounts. The fight continues. Red state legislators are trying to put a lid on teacher activism, but teachers aren't ready to quietly slink back into their classrooms and take whatever their districts and states hand them. Last week, West Virginia teachers overwhelmingly supported some kind of future action if they think it's called for. 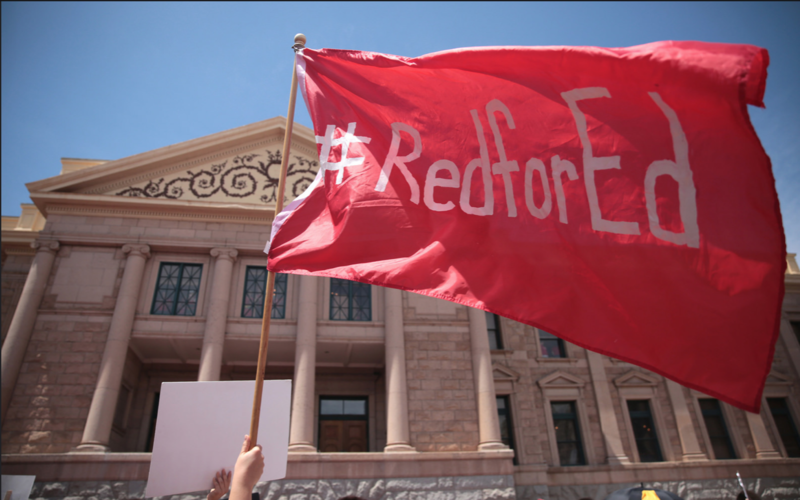 In Arizona, the RedforEd network is alive and well. It could spring back into action this year, depending on what the legislature and the governor do. Meanwhile blue state teachers are beginning to rise up as well: In California, Los Angeles just resolved a teachers strike, and Oakland teachers are prepared to walk out if stalled negotiations don't result in a contract. In Colorado, Denver teachers began their strike Monday.